The Sun is an active star. It manifests not only in everybody’s well-known Sun spots with the related 11-year cycle. This activity manifests not only as the well-known sun spot phenomenon with a related 11-year cycle, but also in flares, coronal mass ejections (CMEs), and solar energetic particle (SEP) events. Thus, the Sun is a giant particle accelerator. Basically, a flare occurs as a local enhancement of the Sun’s emission of electromagnetic radiation from the radio up to the γ-ray range. That indicates the production of energetic electrons during flares. NASA’s RHESSI mission (Lin et al. 2002) has the aim to investigate electron acceleration processes by studying the Sun’s X- and γ-ray emission. A substantial part of the energy released during a flare is carried by these energetic electrons (Lin and Hudson 1971, Emslie et al. 2012). In which way 1036 electrons are accelerated up to energies beyond 30 keV, is one of the open questions in solar physics. A flare is considered as the manifestation of magnetic reconnection in the solar corona. The generation of energetic electrons at shocks, i.e. both fast- and slow-mode shocks, occurring in the magnetic reconnection region are described in detail. It is shown, that these shocks are able to produce enough energetic electrons, which are needed to explain the hard X-ray flare emission as measured by RHESSI. Presently, the flare is widely understood in terms of the so-called standard (or CSHKP) model (Carmicahel 1964, Sturrock 1966, Hirayama 1974, Kopp and Pneuman 1976). Fig. 1 shows schematically the scenario of this model. According to this model, in the corona, a prominence as a closed magnetic field structure is destablized due to its photospheric footpoint motions and rises upwards. Hence, the underlying magnetic field lines are stretched. That leads to the formation of a current sheet. If the current within this sheet exceeds a critical value, the resistivity is suddenly increased by plasma wave excitation due to various instabilities (Treumann and Baumjohann 1997). Then, magnetic reconnection can take place there. The region of enhanced resistivity is called the diffusion region. 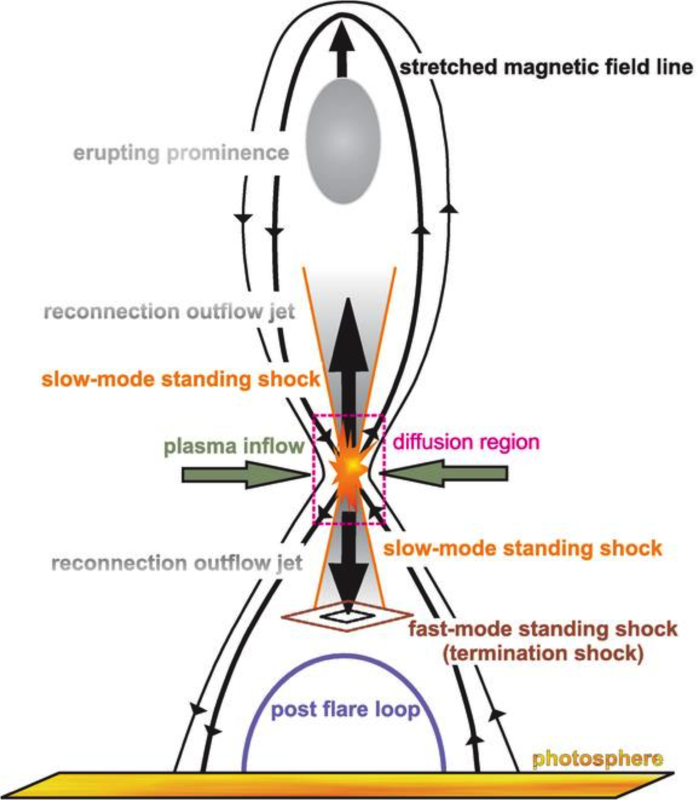 Because of the strong curvature of the magnetic field lines in the vicinity of the diffusion region, the slowly inflowing plasma shoots away from the reconnection site as oppositely directed hot jets. The inflow region is separated from the outflow one by pairs of slow-mode standing shocks. If the speed of the outflow jet is super-Alfvénic, a fast-mode shock, which is called termination shock (TS), is established. Electrons accelerated at the magnetic reconnection site travel down, and emit hard X-rays via Bremsstrahlung (Brown 1971). In the framework of the standard model, several mechanisms of electron acceleration have been proposed. They act at different places of the reconnection region, e.g., in the diffusion region, in the turbulent outflow region, and at the TS as well as at the slow-mode shocks. The role which both shocks play in the generation of energetic electrons is discussed in detail. The TS is a nearly perpendicular shock at which shock drift acceleration (SDA) can efficiently take place. The SDA is described in a fully relativistic manner (Mann et al. 2009). Since the angle between the shock normal and the magnetic field varies over a broad range, a broad spectrum of energetic electrons can be produced at the TS. It was shown that SDA at the TS provides enough energetic electrons as needed for the hard X-ray radiation if the outflow plasma in the upstream region of the TS is already sufficiently preheated. In the case of the slow-mode shocks, the downstream (or outflow) plasma is strongly heated under coronal circumstances. Then, they generate enough energetic electrons if the Alfvén velocity in the inflow region of the reconnection site is high enough, i.e. > 2800 km/s. Then, ~15% of the inflowing electrons are accelerated up to energies >30 keV and they carry ~35% of the flare released energy. These results are well in agreement with RHESSI observations (Mann and Warmuth 2011, Oka et al. 2013, Krucker and Battaglia 2014). In the past several mechanisms have been proposed for electron acceleration in the flare plasma. But there is no complete theoretical model which explains all facets of observations. Hence, electron acceleration at flares is still an open problem in solar physics. The X-ray telescope STIX for ESA/NASA’s space mission Solar Orbiter will contribute to solve this problem in the next decade. The content of this nugget was recently published in “Journal of Plasma Physics” (2015, Vol 81, 475810601) as an invited paper for the special issue “Energetic Electrons in Space and Laboratory”.